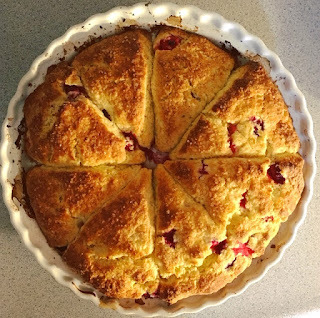 Quilting Adventures: Vanilla Cranberry Scones ...! I just love cranberry scones ... So I've been working on perfecting a recipe to give me a delicious Vanilla cranberry scone. It's been challenging, but I think I've got it! I like to work with a "mise en place" which means to put everything in place. It is a technique I learned when I started baking bread from scratch. By having all of my ingredients in place, I don't have to worry about missing anything ... did I add the salt? "Mise en place" simplifies things ... yea some of you might say ... but that just creates more dishes to wash. Yes, but well worth it. Besides, I have come to enjoy doing the dishes. My mom never asked any of us kids to help wash the dishes ... we were free to play. I asked her recently about this and she said "doing the dishes was my quiet time, a time for reflection" I get it! A great tool to have for any recipe that requires cutting in fat is a pastry cutter. Because we will be working with cold butter, you want a sturdy one. There are two types of pastry cutter, the one that looks like a whisk is actually used for cutting in soft fats. Never use that one with hard butter, you'll trash it. After you've mixed your dry ingredients together (I use a whisk), add the cold butter. This will create layers in your scone ... flakier scones. Add the cranberries. I tend to purchase cranberries in season, wash and freeze them. By using frozen cranberries, they will not break down and colour your dough while you are mixing. Now add the liquids ... mix. Do not over mix. The goal is NOT to develop the gluten strands. On a lightly flour surface, work the batter lightly and create the desired shape. In my case, I use a scone dish so I shape my dough into a scone circle. I use the underside of my scone dish to mark the size of my pieces. Place the wedges in the scone dish. Baste the scones with milk and sprinkle with a form of sugar crystal. I hope you enjoyed this post. Drop me a note and let me know! Those sound really good. I’ll have to give them a try. i absolutely love scones and absolutely try this it seems simple i usually make tea biscuits but will love to make these thanks for taking the time to share! Ooooh, Yum! Those look wonderful. Is it bad that I'd opt for the cream instead of the milk LOL? Thanks for the recipe -- do you suppose you could use dried cranberries (the ones that are like raisins? Those look delicious!! Thanks for sharing the recipe! Baby ... It's cold outside!